Taste test: These wide-rippled potato chips had a good kick of a strong ketchup taste, very tomatoey and slightly vinegary. The red flavor powder was distributed very evenly across all of the chips. 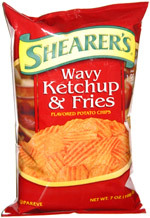 The ketchup taste was very nice, and these were popular around the chip bowl. Smell test: Very good ketchup smell. More tomatoey than vinegary.